MMF Reform: How will it impact you? Your questions answered. How will money market fund (MMF) reform impact treasury investment strategy? On 19 April, the policy and technical team at the Association of Corporate Treasurers held a webinar in association with Fitch Ratings to answer this very question. With just over a couple hundred attendees and some great insight from Alastair Sewell at Fitch Ratings, we unfortunately ran out of time to answer everyone’s questions, which is why we have compiled them into an article below by Alastair Sewell and Michelle Price, Policy & Technical Director at the ACT. To answer further questions on your treasury regulatory and technical needs contact the ACT Policy and Technical team on technical@treasurers.org. To answer question on MMF ratings please contact alastair.sewell@fitchratings.com. 1. Has there been any decision on Euro CNAV funds being able to convert to the LVNAV structure in terms of the Reverse Distribution Mechanism (RDM)? The European Commission stated on 2 February 2018 that reverse distribution (or share cancellation) mechanisms will not be allowed under the European MMF reforms. However, there has been no formal change to the Regulation itself nor other formal documents (such as a Circular) issued indicating that reverse distribution mechanisms are not allowed. Therefore, some fund managers may take the view that, without an explicit ban on such structures through a formal channel, they can continue with this practice. This would mean that distributing share classes in euro low volatility net asset value (LVNAV) funds would be possible. Alternatively, euro LVNAVs would also become possible in the event thatsuch funds could sustainably deliver positive yields and thus avoid the need to apply reverse distribution mechanisms. We do not expect significant rate rises in the near term. Fitch Ratings’ economics group expects the ECB policy rate to stay at 0% in 2018 and to rise only to 0.5% by the end of 2019. Given low euro interest rates(one-week euro LIBOR was -42bp on 26 April 2018), euro-denominated constant net asset value (CNAV) MMFs routinely apply share cancellation to maintain a stable net asset value per share, an important feature for many investors. Most providers thought they would convert their CNAV funds to the new LVNAV fund category being introduced by the reforms, and saw LVNAV funds as central to their post-reform product line-up. The launch of LVNAV funds in US dollars and sterling is not at risk as these funds do not need to apply reverse distribution mechanisms, given the higher short-term rates for these currencies. 2. With regards to the Reverse Distribution Mechanism (RDM), does the European Commission's statement on 2 February 2018 suggest that share cancellation mechanisms will not be allowed? No. This is only a question where LVNAVs need to use RDMs – which is currently only applicable to euros given the negative short-term euro rates. We consider LVNAV entirely viable in US dollars and pound sterling. Despite the European Commission’s statement, we continue to expect that LVNAV funds will be the largest MMF group in Europe post-reform. 3. Is there any danger of future different interpretations of this reform from EU members or other bodies such as the European Securities and Markets Authority (ESMA)? The reforms are a European regulation (as opposed to a directive), which means they are written directly into each member state’s laws immediately. In comparison, directives set an overarching goal to be achieved through national-level legislation. This means that as a regulation, the legal text of the reforms is identical across all EU member states. ESMA published final technical guidance on the reforms in November 2017. Lobbying is underway on the provisions relating to reverse distribution mechanisms (RDM). The reforms are scheduled for a five-year review concluding in 2022. 4. What is the current corporate treasurers’ approach to the treatment of cash and cash equivalents with their auditors? In France, the Autorité des Marchés Financiers (AMF) defines both short-term and standard MMFs as being eligible for cash and cash equivalents status under IFRS. The AMF also allows some bond funds to be considered as cash and cash equivalents, which may lead to flows out of standard MMFs into these funds over time, driven by yield differential. This level of clarity in treatment is absent in other EU jurisdictions to date. In the US, the Securities and Exchange Commission defines money market funds as a cash equivalent. Fitch Ratings will still typically consider holdings in new forms of European MMFs as equivalent to cash in its calculations of corporate net debt metrics and immediate liquidity resources. MMFs are typically treated as cash under Fitch’s corporate rating criteria when they are located in developed jurisdictions and used by a corporate with broadly conservative financial policies. This reflects Fitch’s view that they allow timely, unconditional availability of cash to the rated entity and offer reasonable certainty that the attributable value at par will be available. 5. Will Fitch Ratings be considering same-day VNAV funds as cash and cash equivalent post reform? 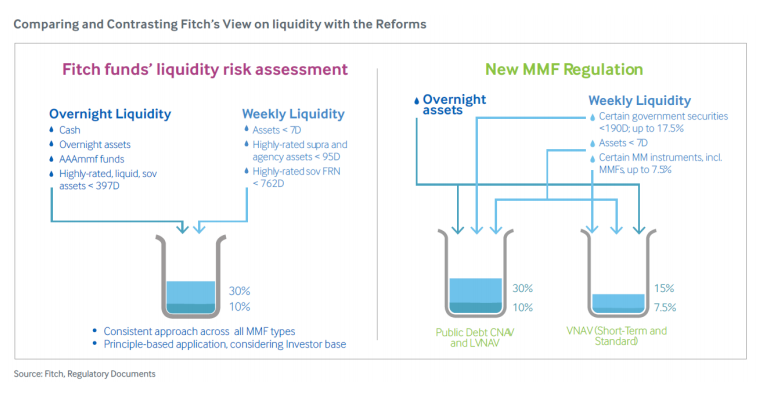 Fitch Ratings will still typically consider MMFs (including short-term VNAVs) in developed jurisdictions as equivalent to cash in its calculations of corporate net debt metrics and immediate liquidity resources for corporates with conservative financial policies. liquidity to levels even higher than current levels post-reform which should further reduce the likelihood of ever hitting any gate or fee trigger. 6. What are the expected sizes of the various reformed funds? Corporate treasury policies often have limits set at a certain percentage of fund size and might run into issues if reformed CNAV funds appear to be smaller in LVNAV size. We expect LVNAV to become the largest overall MMF segment in Europe post-reform. We do not expect a material reduction in individual fund sizes, although repatriation-driven flows may affect some US dollar-denominated funds over time. 7. Is it the expectation that the cash funds will still be ‘AAA’ rated? Yes. It is highly likely that cash funds will still be ‘AAA’ rated. The main risk European MMF reforms pose to ratings is from unexpected disruption during the transition process. However, we expect fund managers to take steps to mitigate these risks, including strengthening liquidity during the transition. Fitch Ratings will continue rating funds ‘AAAmmf’. Fitch’s Rating Outlook for MMFs globally is Stable. The new rules will not change Fitch Rating’s approach to rating MMFs and therefore should not directly affect ratings unless funds’ underlying credit, market or liquidity risks increase. Fitch’s rating criteria applies equally to all short-term MMF types (government CNAV, LVNAV and short-term VNAV). 8. How is 'weekly liquidity' defined? The reforms define weekly liquidity as the sum of securities maturing within one week and certain ‘eligible’ securities (government- and government-related securities with a maximum residual maturity of up to 190 days). However, there is a cap on the proportion of eligible securities which count towards weekly liquidity. Fitch Ratings’rating criteria and require only that the asset in question has a ‘favourable’ credit assessment by the investment manager. This could lead to wide disparity in the composition of unrated funds’ eligible weekly liquidity assets. In the extreme, a fund could consider a short-dated Greek government bond eligible for liquidity given the absence of minimum credit quality thresholds in the reforms. 9. With such tight liquidity restrictions,what is the expected performance differential between VNAV and LVNAV? Short-term VNAV face fewer investment restrictions than LVNAVs; for example, short-term VNAVs are required to hold 15% weekly liquidity compared with 30% for LVNAVs. All else being equal, this implies a greater yield generation potential in short-term VNAVs than LVNAVs, although the actual difference will depend on many factors. 10. How did the Net Asset Value (NAV) corridor look during the crisis? The composition of MMFs prior to the financial crisis was different to their current or, indeed, future (post-reform) composition. For example, pre-crisis they had the ability to invest in structured investment vehicle securities which they would not be able to hold today. Therefore, it is hard to draw realistic comparisons between their NAV stability then and their likely future NAV stability. 11. In respect of current funds converting to the new style funds, some national authorities say there is a need to be authorised before 21 January 2019. This appears incorrect – Article 44 existing funds must submit an application for authorisation from its national regulator by 21 January 2019, rather than have obtained its authorisation by this date. The article requires the regulator to complete its assessment within two months. Do you think the timescale stated is the right assumption or should existing funds be given until 21 March 2019 to abide by the new regulation? Our understanding is that most existing funds expect to transition to one of the new fund types by 21 January 2019. Guidance by national competent authorities may vary. In the public domain the FCA clarified in July 2018 that authorisation (as opposed to compliance) is required by 21 January 2019 (a Monday). This implies that some funds may not actually convert until after the January regulatory deadline. That being said, to date those fund managers that have publicly announced conversions have indicated that these will occur primarily in the fourth quarter of this year; however, due to the uncertainty introduced by the Reverse Distribution Mechanism debate some fund managers may choose to delay the conversion of their funds to early January. 12. Do you expect any impact of Brexit on the UK-based companies investing in EU MMF after the reforms? We do not expect any near-term change in UK entities’ ability to invest in onshore European funds. However, until such time as the final outcome of Brexit becomes clear there will be uncertainty. It is important to state that non-EU investors routinely invest in EU funds already: EU-domiciled MMFs are registered for sale in multiple non-EU countries. 13. Will MMF providers consider establishing LVNAV funds in the UK in light of Brexit? Currently, most MMF managers expect to be able to sell their EU-domiciled MMFs into the UK post Brexit, as they would sell their MMFs into other non-EU countries. However, this will depend on the final terms of Brexit. We expect managers of existing UK-domiciled CNAV funds will convert them into UK-domiciled LVNAVs. 14. Is there any advice on obtaining Securities & Futures Commission (SFC) approval for a fund converting to a CNAV? While some European MMFs are registered for sale in Hong Kong, many more are registered for sale in Singapore. The SFC has an established authorisation process for UCITS funds (which include MMFs). Where there are changes to MMFs to comply with enhanced home-country requirements, these changes need to be filed with the SFC based on the SFC’s UCITS FAQs. However, the SFC may also have additional requirements.